Last weekend we were in The Hague to visit the Tong Tong Fair at the Malieveld. A successful trip with an overnight stay at the Parkhotel. On Sunday there was at "Lange Voorhout" a book-, antique- and curio-market. Despite the baggage, we brought with us, we are just walking along. The weather was dry. In one of the book stalls, I found this auction guide of the collection of Boudewijn Büch. A gadget that I wanted. 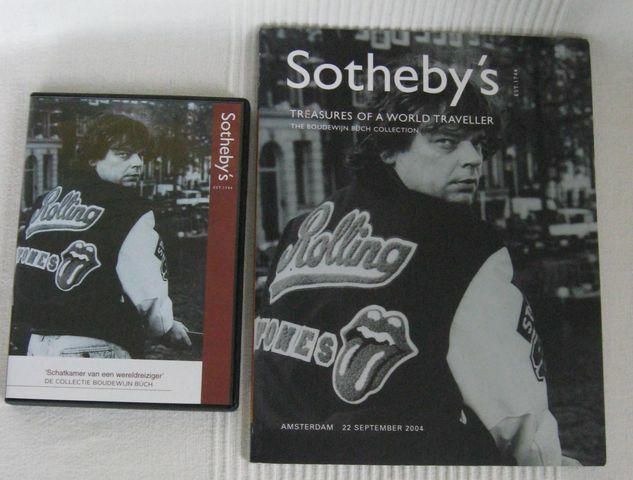 This book includes a DVD with a little tour of his house. Boudewijn collected a lot of books about different countries, celebrities and (almost) extinct animals, like the Dodo. The picture is made by myself. Last week it was a holiday week for me. I planned a few days to Bolsward (Friesland) and the other days I was in the village of Zuidlaren in JO33IC. On this location I wanted do some wspr experiments, it’s the village where my mother lives. Mondayevening I switch on my equipment for WSPR, start on 30M. In combination with the attenuator I wanted to transmit with 50mW, but…………. I saw lines on my screen but no decodes. Very strange, I saw a kind of delay in the start on the screen. I was searching on the internet to see if this is a problem in combination with Windows 7, I found nothing. I never had this on my Laptop with XP. In a Dutch forum I found something about the time synchronisation. I changed this to time.kpn.net . On this tuesday I made a few cw qso’s, the most on 30M, with different stations in Europe. During my stay in Friesland, we also visited the city of Harlingen. I toke a photo of the lighthouse in this place. The lighthouse is no longer in use but at a hefty price you can sleep here for a night. On Friday I came back from Bolsward and start up the equipment for WSPR. This time I saw decodes on my screen and stations saw also my transmissions. Was “time.kpn.net” the solution? I’m not sure but it can be. Saturday May 21, 14 different stations received my 50mW signals. Saturdayevening it was time to go home. It was a good feeling that I solved the problem to work WSPR on my new Laptop with Windows 7. Does anyone else have this experience? Last week I received a few QSL's via the buro. One of the cards is from SP3JMZ. 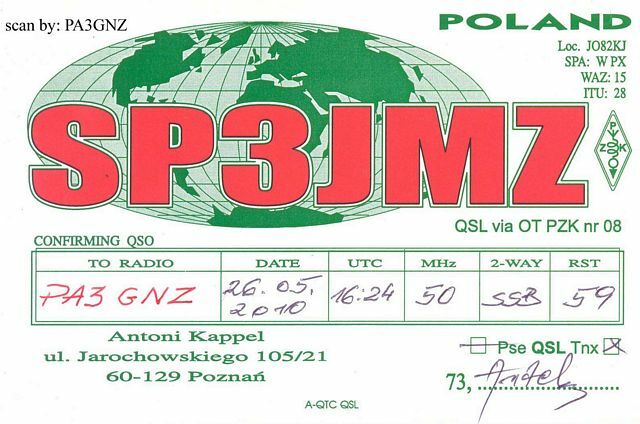 With this card square JO82 is confirmed on 6 meter. The sporadic E season is started but the signals in my QTH are very weak, maybe they will be stronger in the next weeks. Yesterday, I worked (cw) with DK3EE in JO41, a new square. I think this was via Tropo. Today I worked (cw) with 9H1XT in JM75GV, a new DXCC country & square on 6 meter. Today the Es season on 6 meters began for me. The first signals where very weak, I could hardly take the stations. Around 14:30 UTC the signals were stronger and could I work via morse code with HA8CE in KN06EN. Almost half hours later I worked with YO6XK (SSB) in KN25BS, a new square. For this season I will use my Yaesu FT817nd, 5 watts and a modified 5/8 for 2M to a 1/4 GP for 6M.